Iraq used multiple intelligence services to collect on the Regime’s various international and local concerns. The Iraqi Intelligence Service was the former Regime’s largest intelligence service; the Directorate of General Military Intelligence and the Directorate of General Security supported the Regime on a smaller scale. The Iraqi Intelligence Service (IIS) served the Regime as a conventional intelligence service, but it also undertook denial and deception operations to thwart UN inspectors and for the illicit procurement of dual-use materiel and military equipment. The Directorate of General Security (DGS) and Directorate of General Military Intelligence (DGMI), however, generally performed intelligence and security operations in a comparable fashion to other countries’ intelligence services. This annex will provide a view of the most recent organizational structures of these security services. This portion of the Report is largely based on testimony from former Regime officials who were active in many of Iraq’s former governing, economic, security and intelligence organizations. While they were critical to our assessment of the former Regime’s WMD strategy, the detainees would often minimize their involvement or knowledge of sensitive issues. The placement of blame or knowledge with individuals, who were not in a position to contradict their statements, such as deceased or fled to another country, was also a common occurrence. Notwithstanding, most detainees were very cooperative and provided insight into the inter-workings of the former Regime. Original documentation captured during Operation Iraqi Freedom has served to confirm, supplement, and reinforce detainee statements. The original mission of the Iraqi Intelligence Service (IIS), commonly known as the Mukhabarat, was foreign intelligence collection, domestic counterintelligence, and clandestine operations—standard activities for intelligence services worldwide—but the former Regime also used the service, beginning in late 1997, as a tool for the Military Industrial Commission (MIC) and its illicit procurement efforts. 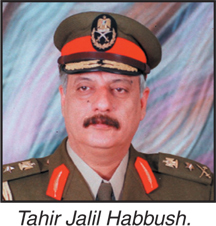 The IIS consisted of over twenty compartmented directorates, under the leadership of Tahir Jalil Habbush. The IIS also assisted in the obstruction of UN inspection missions and concealment of sensitive materials, equipment, and documentation for the former Iraqi Regime. M1 was the executive directorate of the IIS. Subordinate branches provided administrative functions, public relations, the creation of cover documentation for field agents, and general support to the entire service. The most recent director of M1 was Khudayr Isma’il Ibrahim Al Mashhadani. This directorate managed daily administrative affairs and provided the following services: salaries and retirement services; logistic support, including vehicles and medical services; and liaison with government ministries and directorates. M2 also supervised house rentals for each IIS directorate. Every directorate maintained at least one safehouse for relocating operations from regular directorate offices. Husayn Muhsin Hasan, M2’s director, held his position for the eight years prior to OIF. Commonly referred to as the Computer Directorate, and often mistakenly translated as Finance, M3 focused on the training and use of information technology in the IIS. Sa’d ‘Abd-al-Razzaq Al Majid Al Tikriti was responsible for the information, documentation, and file storage for the IIS. M4 was the primary directorate for foreign intelligence collection and foreign operations—it is also referred to as the “Secret Service Directorate,” when literally translated. Collection primarily focused on political and economic information; however, information regarding the military, media, health, and the administrative capabilities of foreign countries was also collected. M4 was headed by Hasan Izbah Thalij Al ‘Ubaydi until 2003. 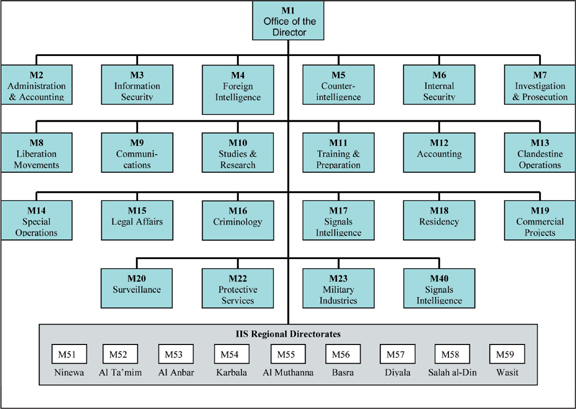 As the director, Hasan reported to IIS Deputy Director Khalil Ibrahim Al Sultan, who was responsible for M4, M5, M40, and monitoring (possibly M-20) directorates. Previously, Hasan had been the M2 Director and the Office Director of M1. A fifth division within M4 targeted Iraqi opposition groups operating outside of Iraq. That division, however, was separated from M4 in 1997 and re-designated M40. The M4 and M5 directorates exchanged information whenever members of either directorate discovered intelligence related to the other directorate’s responsibilities. The Scientific andTechnical Intelligence Department, headed by Muthanna Muhammad Ahmad Al Bayatti aided MIC’s “Special Office” to facilitate the procurement of sensitive items and material through foreign channels (see Regime Finance and Procurement chapter for additional information). M5 conducted domestic monitoring and counterintelligence operations within Iraq. Five divisions within M5 focused on specific regions of interest—similar to M4, its sister directorate. Muhammad ‘Abd-al-Wahhab Fada’am was the M5 Director from 2000 until the fall of the former Regime; he was preceded by Ma’ad Ibrahim Al Duri (1996-2000) and Khalil Ibrahim ‘Abdullah Nasiri (1994-1996). Section M5/4/14 monitored all international organizations operating within Iraq, including the UN. As stated by a former manager within the M5 Directorate, “It [M5/4/14] monitored the UN inspectors because that was its mission.” Shakir Karhut headed this section until OIF and worked under Mu’ayyid ‘Abd-al-Jalil, the head of M5/4. According to high level officials within the former Regime, these two were heavily involved in collection efforts against the UN. The IIS General Affairs Division (M5/5) is the most recent sub-directorate. It was specifically created to act as the “catch-all” for M5 operations within Iraq. Section 18 operated more than 40 domestic businesses within Iraq, such as restaurants, hotels, travel services, souvenir shops, and truck service centers, in order to collect information on foreigners routinely entering Iraq. Other sections reportedly monitored foreign journalists, the media, and foreign students within Iraq. The IIS had regional offices for local collection, which carried out the functions of various national-level IIS directorates in the local governorates. These regional offices were called directorates despite their small size and limited capabilities. While they were not subordinate to the M5 Directorate, they fell under M5 administratively. The IIS functional directorates, such as M4, M5, M20, and M22, had liaison offices within these regional directorates. Tasking would be passed down from the national-level to the local offices for collection or protection missions. Khalid Najim ‘Abdallah Sultan Al Tikriti directed a staff of approximately 200 security officers who acted as political minders within the IIS. Personally appointed by Saddam, the M6 director had sweeping powers of investigation and financial authority. Like a satellite office of the SSO, M6 and its three divisions monitored the loyalty of all IIS employees. The first division supplied liaison officers to each IIS directorate and was responsible for technical monitoring, the archives, and security of the MIC; the second division was responsible for political mail, diplomatic couriers, and information security; and the third was responsible for the physical security of IIS headquarters and its arsenal. M7 oversaw the Hakamiyah prison facility in Baghdad and was last headed by Haythim Khalil Ibrahim Al Rawi. M7 had sub-directorates to investigate Arabs and foreigners, as well as for prison management and administration. M6 and M10 often provided additional support in internal investigations and interrogations. In the opinion of a former IIS officer, the M8 Directorate was a political office instead of an intelligence collection or exploitation directorate. Formerly directed by Khalid Al Duri, M8 was responsible for supplying administrative support for approved Palestinian organizations, receiving guests, providing hospitality, and arranging visits with officials. The source also stated that the M8 director reported directly to Tariq ‘Aziz on matters concerning Palestinians coming to Iraq from Syria. M9 dealt with landline and wireless communications requirements between all IIS directorates. The IIS primarily used landlines for communications security; wireless communications were used only as an alternative if the land lines were down. The last director of M9 was Shibli Muhammad ‘Ali. Information is not yet available in regards to when M9 assumed its benign role of communications. The Secret Communications section handled the monitoring of postal communications and the development of invisible or secret inks. The Physiochemical Analysis and Criminal Investigations section conducted scientific analysis and research. The Explosives section was an independent unit that was located separate from the rest of M9/J to keep it as compartmented as possible. It conducted both explosive preparations and investigations for both offensive and defensive purposes. Dr. Al Azmirli, after leaving M9/J in 1987, acted as a technical and scientific consultant who reported directly to the IIS director. Dr. ‘Ali Mukhlif replaced Al Azmirli as head of M9/J, however by 1988, Dr. Mukhlif could not directly report to the IIS director as in the past. He was required to report to a General Director (directorate level) and a “technical advisor.” Mukhlif would see the department through its next transformation in 1990, but he was replaced by Dr. ‘Amir ‘Awan Juma’a Al Tikriti in 1991. From 1980-1990, M9 developed chemical and biological weapons, produced toxins, poisons, and lethal devices for intelligence or assassination operations, and tested its products on prisoners. In the early 1980s M9 was known as the IIS Science and Technology Directorate, which had four divisions: Engineering, Chemical, Mechanical, and Electronics. M9/J, a subordinate section headed by Dr. Muhammad ‘Abd-al-Mun’im Al Azmirli, established labs after the start of the Iran-Iraq War for the development of chemical and biological weapons. According to Nu’man ‘Ali Muhammad Al Tikriti, a former department director within M9/J, prisoners from Al Hakamiyah Prison were used and killed by M9’s products in late 1983. M9/J was removed from M9 in 1990, and it was assigned as its own directorate, M16. It retained most of its previous structure except for the Explosives Section, which was removed from its ranks entirely and also assigned as its own directorate, M21 (See the M16 and M21 sections of this annex for additional information). M10, also referred to as the “analytic directorate,” was responsible for seeking, compiling, translating, and publishing open source materials from foreign governments, agencies, and organizations. Researchers investigated political, economical, social, international, and military topics and in-house linguists made translations. The director of M10 was Anmar Latif Nusayyif Jasim Al Dulaymi. The Training and Preparation staff, approximately 70 employees, prepared lectures and intelligence courses for both new and current IIS officers and employees on a yearly curriculum. The director of M11 was Mu’affiq Saleh Al ’Ali Al Tikriti. Headed by Nazar Yasin Al Maslawi, M12 was responsible for domestic and foreign bank accounts and IIS financial matters. Sub-directorates managed expenditures, financial archives, and salaries, as well as supporting the comptroller. Each IIS directorate had an M12 officer to handle all accounting affairs of that directorate, such as the distribution of salaries, purchasing of equipment, food, clothing, and other directorate specific items. M13 was responsible for operational support services, such as lock-picking, surveillance photography, electronic eavesdropping, and counterintelligence functions at Iraqi embassies abroad. When a target was identified and approved for collection, M13 conducted the operation. Analysis of the collected information, however, was left to the requestor. M5 most likely tasked M13 to collect against UN inspectors, who were monitored through wire taps, listening devices, and hidden cameras at the Canal Hotel, which served as the UN Headquarters in Baghdad. After Desert Storm, the High Technology Photography and Electronics Research and Development Project was subsumed into the Directorate of Clandestine Operations. For this reason, M13 is also commonly referred to as the Technical Operations or Technical Monitoring Directorate. M15 provided the IIS officers and employees with legal advice, handled all employees’ legal cases, reviewed all new laws that pertained to IIS officers, and implemented the laws and regulations within the IIS. While it served all of IIS, M15 primarily assisted M1 and M2. M16 was created when M9/J was extracted from M9 and designated as its own directorate in 1990. The directorate retained the organizational structure of M9/J except for the Explosives Section, which was also designated as its own directorate, the Al Ghafiqi Project (M21). The services M16 provided in the fields of chemical and biological science, criminal investigation and forensic sciences, chemical and poison production, and intelligence support offer insight to its nickname, the “Directorate of Special Logistics.” Nu’man ‘Ali Muhammad Al Tikriti was M16’s last director having served from 1996 until 2003. In late 2001 or early 2002, M16 requested assistance from the IIS Scientific and Technical Intelligence Department (M4/4/5) to acquire specialized equipment for M16. Devices were requested for atomic absorption, infrared, and ultraviolet spectrophotometers for the analysis of chemical substances; x-ray and bomb detection devices which were planned for use in Iraqi embassies; materials used to detect and exploit latent fingerprints for criminal investigations; and a device used to test for forged or falsified documentation requested by the Secret Communications Directorate. M17 monitored, collected, and analyzed external signals and voice communications. The signals intelligence project, formerly known as “Project 858,” was almost completely destroyed during the first Gulf War. Following the war, the project was resurrected and re-designated the “Hadi Project.” Responsibility for it was passed between Iraq’s intelligence and security services until a presidential decree in the late 1990s brought it permanently into the IIS as M17. The directorate was the largest in the IIS, consisting of four divisions and two branches, and employing between 2,000 to 2,500 personnel. Khalid Karim Khalifa Braish Al ’Ajili was the director of M17 from 1995 to the beginning of OIF. M17 was the pinnacle of Iraqi signals intelligence. It monitored internal Iraqi communications to ensure communications security, intercepted foreign military communications, and collected against foreign embassies, UN Headquarters, and, from 1995 to 1998, UN inspectors. Special Operations Department, composed of a foreign and a domestic section, performed government-sanctioned assassinations inside or outside of Iraq. The “Tiger Group” was similar to Special Operations, except that it was primarily comprised of suicide bombers. The Secret Communications Division was responsible for document seals and stamps, document authentication, and mail security. The division also worked on improving secret and invisible inks. The Physiochemical Analysis and Forensic Criminal Investigations performed various testing on foods and medicines, e.g. it tested for bacteria and viruses in food, dairy products, and water. The forensics department specialized in fingerprints, ballistics, forgery, and the protection of diplomatic mail. The Chemical Preparation Division conducted theoretical and practical research on toxic materials, poisons, and anesthetics for operational use by other IIS directorates, such as M4 or M5. The Explosives Division, also known as “Section 27,” was responsible for detecting and disabling of explosive devices relating to the mail or vehicles, as well as producing such devices for the IIS. This division was a hybrid between M16’s former explosive ordinance disposal section and the former M21 Al Ghafiqi Project. According to captured documentation, on 29 September 1999 the IIS Director approved the deconstruction of the Special Materials Division, as well as M21, the Al Ghafiqi Project. The Special Materials Section was reorganized so that the Explosives Detection and Treatment Section could merge with the Al Ghafiqi Project under M16 for the “unification of technical specialties…since the defensive work is so closely tied with offensive work.” The Radiation Detection utility was to remain with M16. M18 issued visas, determined residency status, and enforced immigration laws for all Arabs and foreigners living in Iraq. The Directorate of Commercial Projects ran front companies to help illicit procurement and importation of dual-use materiel and other prohibited items into Iraq. The Foreign Branch oversaw the management of trade with overseas front companies, such as MIC’s Al Basha’ir Trade Company, Ltd., and the Syrian firms SES Trade Company and the MAS Economic Group. The Domestic Branch oversaw the management of numerous small businesses throughout Iraq to financially supplement IIS operations, usage by the IIS, such as print shops for forgery, and strategic surveillance of foreign interests. In 1997, M19 director Mana’ ‘Abdallah Rashid ordered a halt to all Foreign Branch operations as a result of the failure of one of its companies to deliver spare parts, tires, batteries, electronic equipment, and vehicles. At the same time, the manager of the Domestic Branch was jailed for attempting to smuggle copper out of Iraq. These two incidents led to the permanent closure and subsequent salvage of the Directorate of Commercial Projects. M19 was disbanded and its sections were reassigned to the M4 and M5 Directorates. The Foreign Branch projects were re-designated as M4/8 under the Directorate of Foreign Intelligence. The Domestic Branch projects were re-designated as M5/5/18 under the Directorate of Counterintelligence (see Regime Finance and Procurement for additional information on illicit procurement). The Directorate of Surveillance monitored individual targets with human surveillance and may have been involved in collection against UN inspectors. M20, with three field intelligence units and an administrative branch, was directly subordinate to the IIS Deputy Director. Support requests had to first be approved by the Deputy Director before tasking was executed. Requests also had to provide specific information on targets and the intended location of surveillance. Restricted manpower and resources, however, limited collection periods to approximately seven to ten days. Akram ‘Umar Salih Al Tikriti was the director of M20 from 2000 to OIF. The Al Ghafiqi Project existed to make explosive devices for the IIS to be used in assassination and demolition operations. The Explosives Section of M9/J was extracted from the M9 Directorate in 1990 and assigned as its own directorate, M21; at the same time, the remainder of M9/J was also extracted and designated as M16. The name Al Ghafiqi, referring to a geographic area between Saudi Arabia and Kuwait, was most likely attached to the project in 1990 as it was designated as an independent directorate. The project is also known as “sheen 27,” where ‘sheen’ is the first letter in the word for Section, however, this was not seen until after 2000. Khalil Ibrahim Fayad Al Sabahi was the director of the former Explosives Section since 1986, and he continued to head the organization as the M21 Director until his departure in 1996. Dr. ‘Amir ‘Awni Juma’a, who was previously the M16 director until 1996, was the superintendent of the Al Ghafiqi Project during the negotiations to integrate Al Ghafiqi into M16 in 1999. Badi’a Muhammad Salih was the director of the project, which was decommissioned in 2000 and reassigned to M16. No one person constructed an entire explosive device alone. The construction process drifted through the sections of the directorate. An improvised explosive device (IED) began in the Chemistry Department which developed the explosive materials for the device, the Electronics Department prepared the timers and wiring of the IED, and the Mechanical Department produced the igniters and designed the IED. Al Ghafiqi constantly invented new designs or methods to conceal explosives; books, briefcases, belts, vests, thermoses, car seats, floor mats, and facial tissue boxes were all used to conceal PE4, C4, RDX, or TNT. M18/4 The Regional Division: satellite office located at the various regional governorates and points of origin. The Directorate of Protective Services was similar in composition to a light infantry battalion and it protected IIS facilities along with the Ba’th Party national leadership. Its most recent director prior to OIF was Khassam Ibrahim Omar Ayyub Al Tikriti. M22 provided external security at IIS sites, while M6 handled internal security issues—similar to the way that the SRG and SSO handled security at presidential palaces. Three subordinate divisions in M22 carried out various physical security missions for the IIS Headquarters in Baghdad, the Mujahiddin è Khaliq (Iranians opposed to the current Iranian Regime), and the IIS Regional Offices (M51 through M59). M22 personnel guarded all IIS safehouses, and M22 personnel may have been present in the event of the transportation of WMD materiel, because it had previously provided convoy security for the shipment of light weapons. Also known as “Al Munzhumah,” M23 provided security for all MIC and IAEC sites, and it assisted teh Natioal Monitoring Directorate (NMD) with purging MIC facilities of documents to be safeguarded from the UN. An Iraqi Regular Army unit was commonly co-located at MIC facilities for external protection, but M23 handled security within the facility, as well as the security staff manning gates at industrial complexes, weapons manufacturing plants, chemical production plants, and MIC offices. M23 also provided limited security for three MIC companies: Armos, Al Basha’ir, and Al Mufakhir—all front companies for illicit MIC procurement. We do not know to what extent M23 provided security for these companies. The last director of M23 was ‘Abd-al-Hamid Sulayman Ibrahim Al Huraymis Al Nasiri. M23 officers also were involved in NMD document concealment and destruction efforts. In August 1998, Saddam ended cooperation with UNSCOM inspections, and soon after he ordered the creation of a NMD committee to purge all MIC records of sensitive documentation related to past prohibited programs. While many documents had already been declared, some were given to M23 agent ‘Ayad Qatan Talab, the director of M23/6/1 Counter-Espionage Section, to keep in a lockbox. These documents have not yet been recovered. The Directorate of General Military Intelligence (DGMI) was Iraq’s main military intelligence service. The DGMI collected intelligence on the military capabilities of the countries adjacent to Iraq, as well as Kurdish forces. The director of DGMI, Staff Lt. Gen. Zuhayr Talib ‘Abd-al-Sattar, reported directly to the Presidential Secretary, despite the subordination of the DGMI to the Ministry of Defense. In addition to military analysis and targeting, the DGMI acted as an internal police force within the Iraqi military by assigning DGMI Intelligence Officers to each military unit down to the battalion level. Technically, the officer’s mission was intelligence support, but the majority of the officer’s work centered on controlling corruption and theft within the unit. Just as the SSO placed political officers within the Republican Guard, the DGMI placed intelligence officers within the military services to monitor troops. This organization has also been recognized as the General Military Intelligence Directorate (GMID), General Directorate of Military Intelligence (GDMI), Directorate of Military Intelligence (DMI), Military Intelligence Directorate (MID), and the Istikhbarat, the shortened version of its Arabic name: Mudiriyah Al Istikhbarat Al ‘Askriah Al ‘Ammah. The Directorate of General Security (DGS) provided local intelligence collection and prosecution of Regime opposition groups within the individual governorates of Iraq. Little reporting exists about its composition and structure, but minor references to the DGS all reflect an effort focused against the infiltration of Iranian, Turkomen, and Kurdish oppositionists.